Royal Canin Canine Obesity Management DP34 is specially formulated to assist your dog in losing weight and returning to a healthy size. Obesity is the nutritional condition defined by an excess of body fat. It can rapidly deteriorate your dog’s general health by making them lethargic and weakening their immune system. It uses a specially developed, low calorie formula, which fulfils your dog's appetite whilst helping it to shed excess weight. Royal Canin Canine Obesity Management DP34 is high in protein and low in carbohydrates. This specialised formula provides all the energy your dog needs, without creating a surplus that its body then turns to fat. It means that your dog can eat as much food as before with no risk of obesity. The high protein content also helps to maintain muscle mass, which is often at risk of deteriorating during a weight loss program. It is also high in the essential nutrients (protein, minerals, and vitamins) vital for a healthy, happy animal. These nutrients also nourish healthy bones and joints, which have often been put under stress by carrying extra body weight. All this combines to leave your pet with good overall health whilst they undergo their weight loss treatment. tasty formula your dog will love. It can sometimes be difficult to spot weight changes in dogs, especially in breeds with long coats or naturally muscular frames. Alongside an increase in body fat, symptoms of excess weight or obesity can be a lack of energy, exhaustion, or limping, as joints and limbs are placed under more stress. Should you notice these symptoms, contact your vet immediately for further advice. 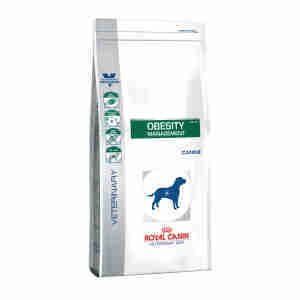 They may recommend Royal Canin Canine Obesity Management DP34 as part of a weight reduction program. Because veterinary diets are formulated for the nutritional support of pets with specific clinical conditions, we recommend that you only use them under professional advice. For more information on feeding Royal Canin Canine Obesity Management DP34 to your dog, please consult your veterinary surgeon. ANALYTICAL CONSTITUENTS: Protein: 34% - Fat content: 10% - Crude ash: 7.5% - Crude fibres: 7.6% - Per kg: Metabolisable energy: 3116 kcal - Omega 6 fatty acids: 22.3 g - Omega 3 fatty acids: 4 g. *L.I.P. : protein selected for its very high assimilation. WET FOOD COMPOSITION: meat and animal derivatives, cereals, eggs and egg derivatives, minerals, oils and fats, derivatives of vegetable origin, molluscs and crustaceans. ADDITIVES (per kg): Nutritional additives: Vitamin D3: 95 IU, E1 (Iron): 7 mg, E5 (Manganese): 2.2 mg, E6 (Zinc): 22 mg - Technological additives: Cassia gum: 4 g.
ANALYTICAL CONSTITUENTS: Protein: 7% - Fat content: 2% - Crude ash: 1.5% - Crude fibres: 1% - Moisture: 86% - Metabolisable energy: 563 kcal/kg. Obesity food my dog loves and it helps to keep his weight down. Excellent food keeps my dog in shape. Also excellent service. Royal Canin great food to keep dogs trim. Excellent delivery service also. Our pug has been eaten this product for about three years and he is always keen for his meals to arrive and devours his allowed amount very quickly, always. It has kept his weight steady. This is an excellent product and the company is outstanding we just email and the beautifully packed box containing the food usually arrives either the next day or the following one, we are very pleased and satisfied with efficient way our order is always dealt with.